This paper analyses how microeconomic factors drive inequality in household wealth across nine European countries when applying the Shapley value approach to decomposition. The research draws on micro data from the Eurosystem Household Finance and Consumption Survey 2014. 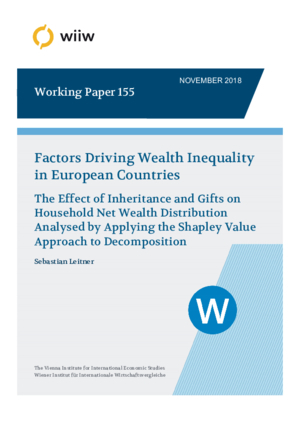 Disparity in inheritance and gifts obtained by households are found to have a considerable effect on wealth inequality that is on average stronger than that of income differences and other factors. In Austria, Germany, France, Portugal and Spain, the contribution of real and financial assets received as bequests or inter vivos transfers attains more than 30% to explained wealth inequality. The distribution of household characteristics (age, education, size, number of adults and children in the household, marital status) within countries however also shapes the observed wealth dispersion. The results resemble those obtained in a similar study (Leitner, 2016) based on data from the first wave of the Eurosystem Household Finance and Consumption Survey (HFCS 2010).